Visual Studio 2010 supports both solution-level and project-level build configurations. The project-level configurations specify sets of build-related properties. The solution-level configuration specifies which projects to build for a particular configuration, as well as the individual project-level configurations to use. There are also both solution-level and project-level platform choices. 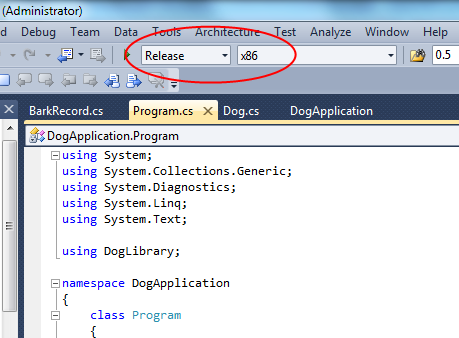 You can see your current solution-level build configuration and platform in the main Visual Studio 2010 toolbar. 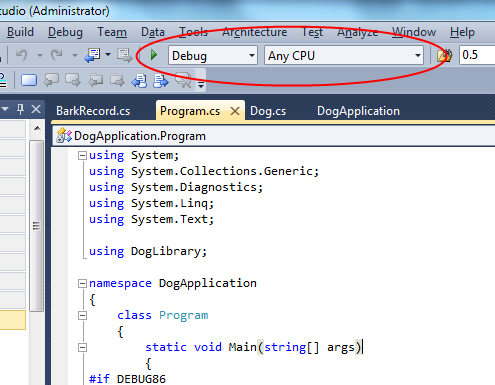 In the example below, the current build configuration is Debug and the current platform is Any CPU. To build your project under a different build configuration or platform, just make a new choice in one or both of these combo boxes. In the example below, we’ve chosen to do a Release build for the x86 platform.